Today, we're celebrating the launch of the EPIC new KENZO x H&M collection. I've been a fan of the Japanese designer brand KENZO since age 5 (seriously, I had a treasured KENZO tee I wore e v e r y w h e r e), and even my all-black goth soul still has a soft spot for its loud statement pieces. I love that its creative pieces are being made more accessible for the everyday consumer through H&M. I mixed and matched my favorites from this collection, wearing a matching mock neck shirt and leggings for a catsuit (ha-ha, get it?) 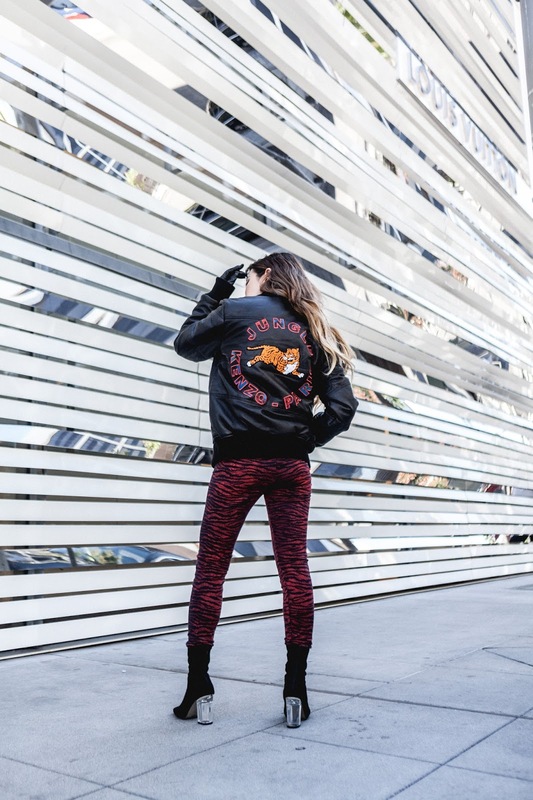 look, leather opera gloves, and a men's leather bomber with the brand emblazoned on the back. I hadn't realized that H&M already styled three of the pieces together in one of their shoots, so I guess I did a pretty good job! Check out the whole collection here and read their story. All from the KENZO x H&M collection, available November 3rd in stores and online. idk, how i feel about this outfit, i like it but i hate it. . . .
Its not even funny how obsessed I've been with the Kenzo collection! It looks FIRE on you! Slay forever! This is literally the best collaboration. Your killing the look. This outfit is so damn gorgeous! Im so excited for the collection to hit stores!